Rinjani mount with segara anak as large caldera. Franck Lavigne of Université Paris, Panthéon - Sorbonne, estimates that in May and October 1257 there has been a cataclysmic catastrophe. A catastrophe that is 8 times larger than the 1883 eruption of Mount Cracatoa/Krakatau and two times more powerful than the eruption of Mount Tambora 200 years ago (1815). Samalas, known as Mount Rinjani, at that time spewed 190 - 270 megatons of material into the atmosphere and sulfur up to 300 - 600 megatons. It is inconceivable, how terrible Samalas shook the world, and now leaves only the beauty of a tragedy. Segara Anak is a caldera formed from the remains of the eruption of 1257 and became a water with an area of ​​1100 ha with a depth of 230 m. Mount Rinjani as its owner becomes a destination for climbers around the world to witness the heritage of natural tragedy and Torean is one way to get there. The reason to climb Rinjani is to foot at 3726 m above sea level and enjoy the beauty of the segara anak at an altitude of 2030 m above sea level. 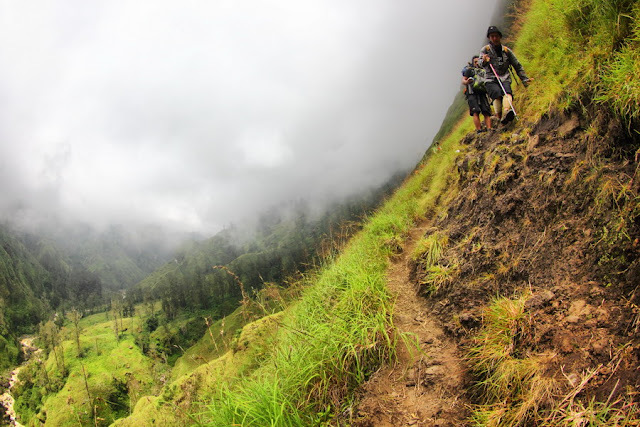 There are 2 official paths to climb Mount Rinjani, namely Sembalun and Senaru. 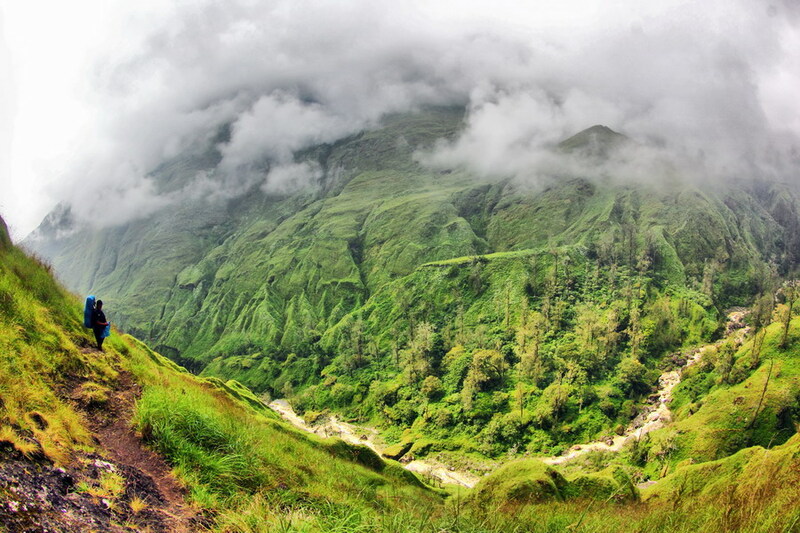 Mount Rinjani National Park (TNGR) defines both routes as the legal route of climbing. In addition to the Sembalun and Senaru lines there are several climbing routes used to reach Segara Anak or Rinjani Peak, is: Sajang, Stokel, and Torean. Torean is one of the climbing route which according to residents around Rinjani is the shortest path to reach the segara anak lakes. The Torean track is often used by residents or Hindu adherents to visit the lake immediately with the aim of fishing and praying. 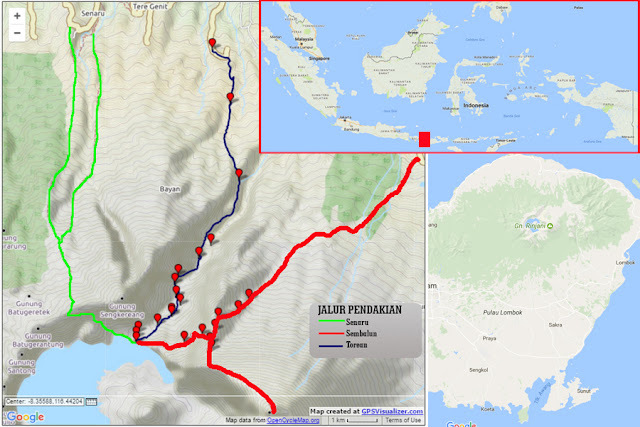 TNGR does not recommend the Torean route because its terrain is quite difficult and has more difficulty levels than the Sembalun and Senaru route, but also to minimize environmental damage and accidents. It is not easy to climb through the Torean track because the terrain is very varied. 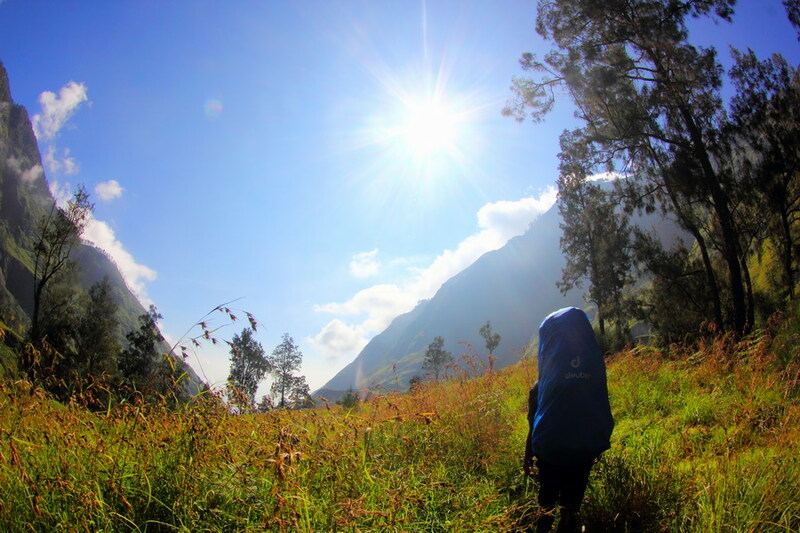 If passing through Sembalun will pass through vast meadows and forests, as well as Senaru but certainly the path is well ordered and clear. The Torean path will pass through forests, slope edges, cross the river and sometimes have to climb steep rock paths and gaping cliffs ready to pounce from below. From the beginning the porter reminded me "I'm happy to pass Torean because it's shorter, I just want to say, if anything happens do not involve us, because this line is unofficial. Later we will pass a difficult path that is, 3 vertical ladder and a cliff steep as high as 3 m. But Torean line is the most beautiful path, we'll see ". A condition and a wind of heaven from the Porter about the Torean path. Initially a little hesitant, but the step should keep going. GPS is on while glancing Sembalun and Senaru lines are not too different for the affairs mileage. Walking slowly from a Torean Hamlet, Loloan Village, Bayan Sub-district, North Lombok District. The gardens of residents with farming plants dominate the first 1 hour of travel. After passing a river will enter in the primary forest is still close vegetation cover. The forest canopy was so tight as if the sunlight was just peeking. Toward the rain splashed and spilled over the entire body. In the rain conditions continue to run without meeting the climbing posts as in the official track. Almost 4 hours past the thick forest with contours up and down. This psychic is sometimes tested how heavy the field is because it has not been out of the meeting vegetation before. A initial note of climbing from an altitude of 600 m above sea level, but senaru route at 1150 m asl with the aim of 2030 m above sea level. Half day I seemed upset with the climbing route through Torean which did not give any chance to see the beauty of nature, besides the beard moss (Usnea barbata) which hung on the branches of the tree that impress the awesomeness. The primate's voice adds that this wilderness is barely touched. The beginning of the ascent that seemed to make this step collapsed in the middle of the road. The rain slowly began to stop. GPS pointed at an altitude of 1800 m above sea level and in front of the eyes of vegetation began to change from wilderness to montana. A waterfall named Penimbung which he said altitude 100 m seen from the top of the climbing route. An exotic waterfall visible in the middle of the valley at this foot stands above it. The sky that had been gloomy began to show its blue color as the fog slowly began to disappear. The warmth of the sun was so noticeable and I realized what the porter said about the wind of heaven. 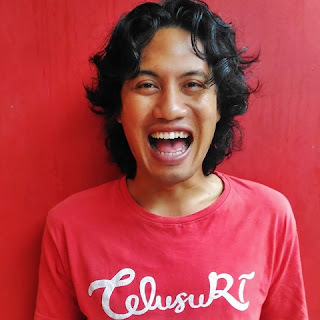 Torean route in a wedge by the top 3 of Sangkareang, Rinjani, and Waja. 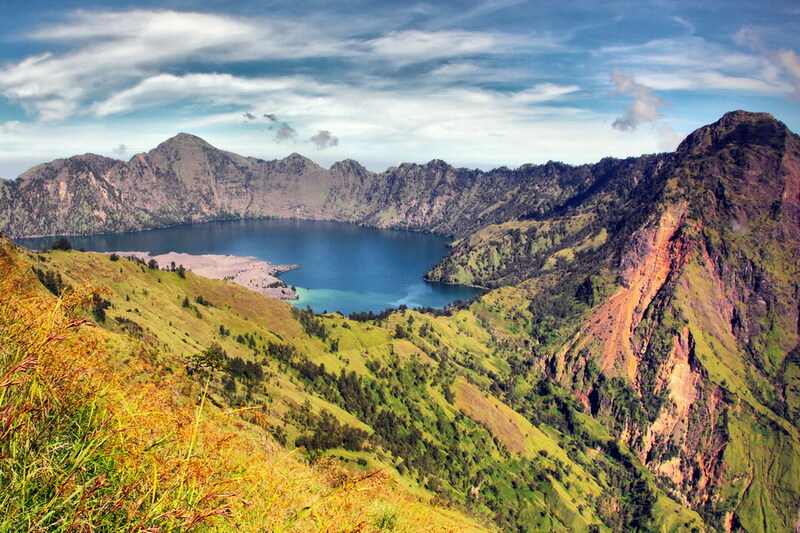 After half a day tempted to enjoy the exotic landscape of Mount Rinjani. The veil of the mist is already open and the eyes are blazing at the beauty of this ascent. Maybe at that time if I may be jumped glad I will do that, but the path is only as wide as the rest of the shoe is a cliff. Side of Torean route as small road. In principle, the Torean route is the path that passes through Kokoq Putih (White River). Kokoq Putih is the exit of Segara Anak lake. The walls of the caldera are torn and become way out of the crater material. This river is white because it contains sulfur elements that are removed from some hot springs and material from the New Mount Jari volcano material. 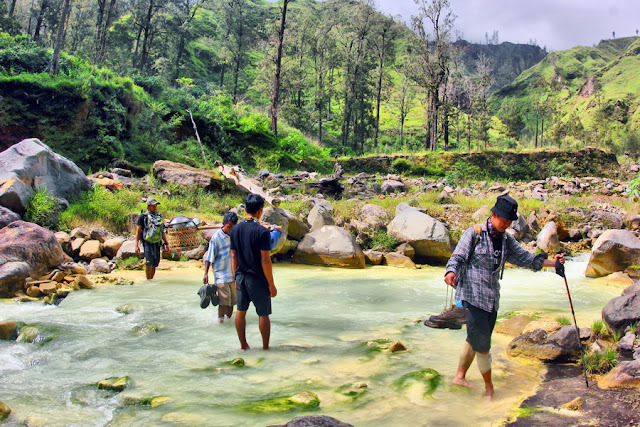 If you follow the flow of Kokoq Putih then the tip will arrive at Segara Anak lake. 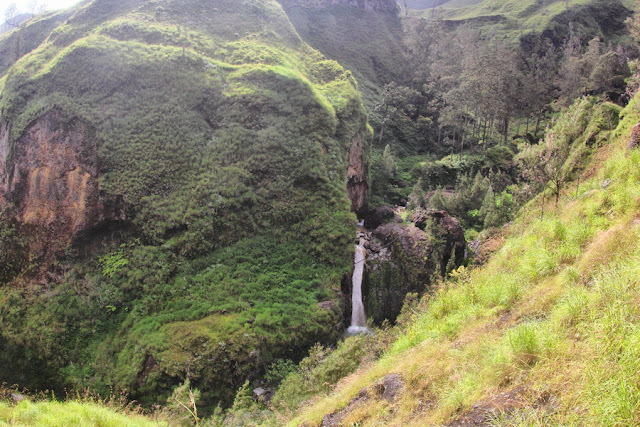 The landscape along Kokoq Putih will pass through 3 pieces of exotic waterfalls. 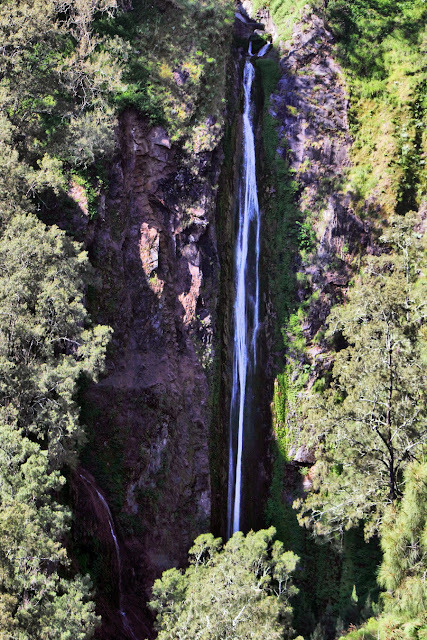 The first waterfall named Penimbung is visible from the top of the cliff, the 2nd waterfall right beside the climbing lane, and the 3rd waterfall is visible from a distance. This time the journey to Segara Anak live leaves the beauty to pay exhausted after half a day rain. The next water fall a long Kokoq Putih river. 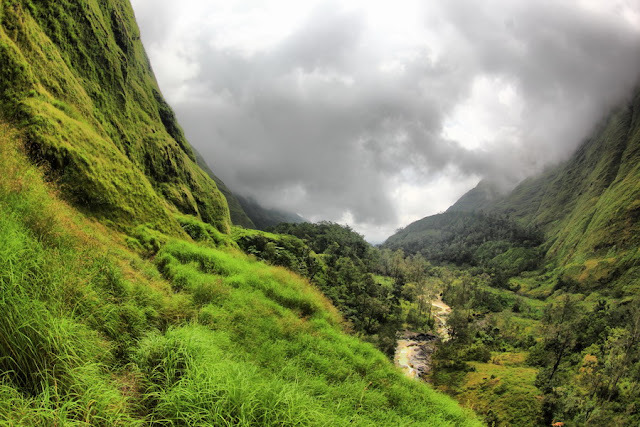 Walk in the middle of a valley flanked by 2 hills high, steep, steep with green. It is unthinkable how awesome this valley formed during the super volcano 1257 tragedy that tore the ridge. Stairs made by local people are helpful across steep and steep paths. Wood that began to decay should be extra careful because Kokoq putih is far down there. The most fun is when this shoe should be removed because it must cross the river. 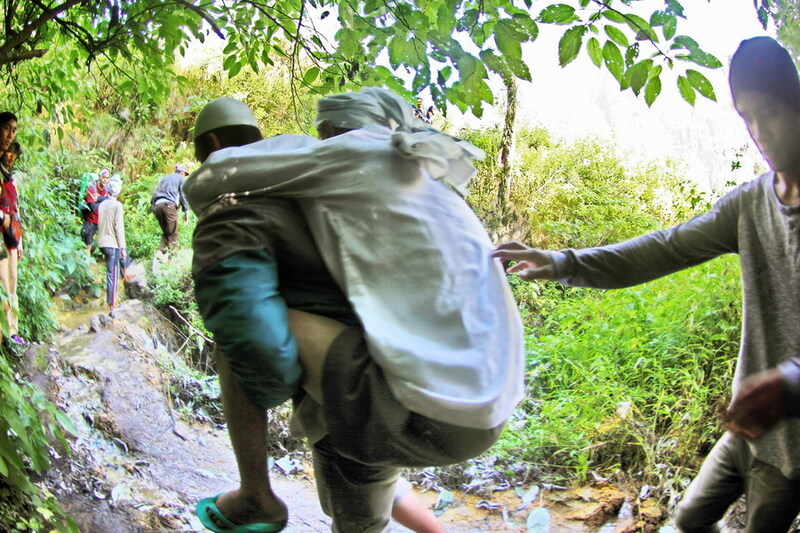 This is the first time this mountain climb 2 times crossing the river. The weary, tired, and stiff legs of suddenly are getting their strength back when they have to wet their way across the river. Pleasure has not arrived there, 1 hour before until immediately the body of this body will be spoiled by hot springs coming out from the bowels of the earth. The locals have already created a shelter pool and this body can be directly immersed to truly enjoy this natural service. After a short while to arrive at Segara Anak, we had to stop. Groups of locals are passing by. A well-built young man was carrying an all-white grandfather. A little girl with only skirts and flip-flops following from behind and middle aged women menyunggi (carrying a load on the head) stock. This entourage said he wanted to perform rituals and praying for healing in Segara Anak and hot springs (Aik Kalak). A ritual of Hindus people going to segara anak for healing. Finally arrived at Segara Anak after a day following Kokoq Putih. 13.7 km GPS tracks this step from Torean to the destination. It is true, if Torean better not be used as the official route of climbing considering the heavy track. In addition, along the path Torean made local residents for spiritual manners. Some point along the path of climbing into a place of worship is marked by the offerings and wrapping a white cloth. But certainly, the Goddess Anjani who mythologically became the ruler of Mount Rinjani has an extraordinary palace one of which is the exotic and mystical Torean aisle.